The best-in-class In-Wall Series speakers, by Steinway Lyngdorf, are specifically designed to be placed behind acoustically transparent screens, fabric panels, and metal mesh grills. With invisible presence, the In-Wall series offers exceptional performance, versatility, and unbeatable appeal. 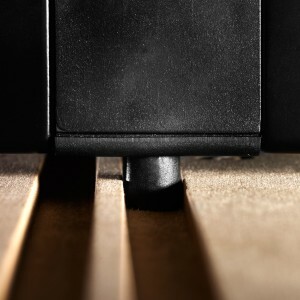 With a larger cabinet size than Steinway Lyngdorf’s traditional point-source speakers, combined with highly efficient drivers, the In-Wall Series speakers have an overall increased sensitivity, allowing for improved dynamic headroom and sound pressure level (SPL) while using less power. The In-Wall series is equipped with steady decoupling brackets, eliminating vibration transfer from the speaker to the wall and substantially cutting down on resonance and sound transfer to adjacent rooms. A stunningly powerful surround sound system can be built by combining the In-Wall speakers with Steinway Lyngdorf Model LS boundary woofers. These provide a fully encompassing experience; because of their recommended installation position, direct sound and reflections from the environment arrive at the listening point at exactly the same time. This added efficiency allows you to play back your audio at higher levels without any distortion.